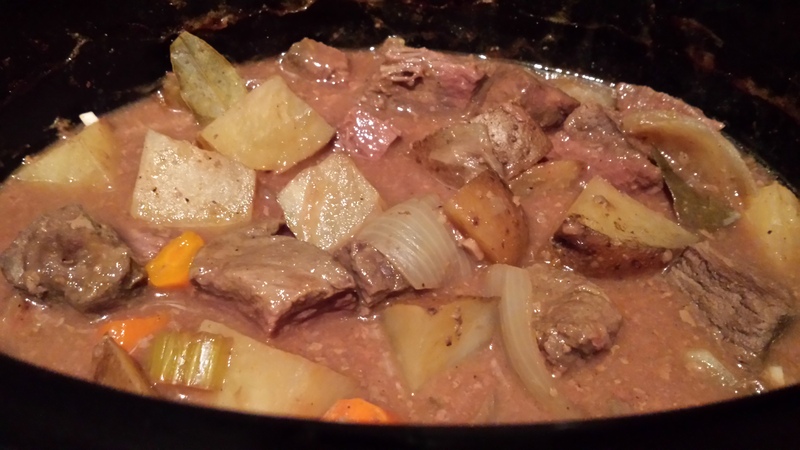 I used this recipe by BUCHKO from All Recipes as the basis from which to make this Classic Elk Stew last Sunday for a perfect wholesome weekend meal after my afternoon x-c ski. The elk meat is extremely tender and required no marinade at all! This recipe will give you leftovers for the week, too, which is very welcome on those nights when you get home from work and just want to EAT. This does take 8 hours on LOW in the slow cooker from start to finish, so it’s a good idea to thaw your roast two days before you plan to make this so you can start it cooking by late morning. Cut elk meat into 1-inch chunks and place into slow cooker. Pour 1/4 cup flour over top to cover the meat. Rinse and peel carrots and slice into rounds. Wash potatoes and cut into chunks with skins on. Rinse celery stalk and cut into pieces. Cut 1/2 yellow onion into big pieces. Place vegetables in slow cooker. Combine beef broth with minced garlic clove, Worcestershire, and seasonings. Pour over top of meat and vegetables. Top it off with a bay leaf and cook on LOW for 8 hours. I served this stew with garlic bread and it was a great combo. This stew will also make your house smell fantastic!